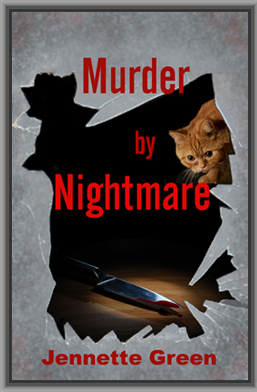 May has never liked to be alone at night, because that’s when the nightmares haunt her. ALONE. THE SILENCE IN THE EMPTY house pressed in on May like a living, suffocating presence. At her elbow at the desk where she sat, a lamp pooled a small circle of light into the darkness which swathed her bedroom. Rick had flown to Portland at noon. Now the long, lonely weekend stretched before her. The fear that she had fought, ever since twilight, felt as dark and heavy upon her spirit as a black shroud. May clenched the pencil tighter and pressed hard on the paper, her fingers slick with perspiration. Everything would be fine. Her neighborhood in southwest Tensdyle couldn’t be any safer. Or more ordinary. At least, she’d thought so until tonight. The pencil point snapped beneath her fingers. May stared at the broken point, and the inane, rhyming words she had scrawled. They mocked her, whispering with secret delight. Tonight, the nightmare would return. Furious shouts pummeled May’s subconscious, but she flicked a hand at her ear. Her attention remained glued to the television newscaster on the screen. May gasped. Three blocks from her house. The smash of breaking glass wrenched May’s gaze from the TV. With a frown, she lurched to her feet. Male voices bellowed, rising in volume, next door at Tom Overstreet’s house. Strange. Eavesdropping wasn’t polite, but who’d know? She slipped to the kitchen window to listen. “…can’t believe it! Four years! ” Another tinkle of glass. “You’re a bloody leech, Overstreet! Go back to your side of the pond!” A door slammed with reverberating ferocity. Gripped by morbid curiosity, May sprinted to her front bedroom and peeked out the slatted blinds. Wiry Mr. Bilmont stood in the middle of the street, his face purple. He shook his fist. “You’ll pay for this, Overstreet! Mark my words, you’ll pay!” His balled fist sliced the air so hard it sent him spinning on his heel. A curtain twitched in a dark window across the street. Mrs. Bilmont, no doubt. Feeling like a peeping tom, May withdrew, and twirled the blinds shut against the fast falling summer dusk. If her husband Rick was here, he’d laugh and call her a nosy parker. Well, she wasn’t. Not particularly. Just curious why Mr. Bilmont had screamed at Tom. May liked Tom Overstreet. When, as newlyweds, she and Rick had moved in last year, Tom had been the first—and only—neighbor to welcome them. Since then, Tom had loaned Rick a lawn mower, edger, clippers, and a weed eater. Tom had also invited them over for several BBQs, and given them desperately needed advice on how to care for their rented home. May slipped back into the kitchen and popped a dinner into the microwave. Why had Tom and Mr. Bilmont been arguing? Maybe it had just been a neighborly spat. Violent, though. Before eating, she twirled more blinds shut against the encroaching blackness. As the dark night enveloped her home, the old, familiar anxiety slid into her heart. Fear burrowed deeper when she remembered the grisly news report. A boy had been stabbed in her own neighborhood. No. She wouldn’t think about it. She wouldn’t surrender to the old, childhood terror. Wasn’t she an adult now, for heaven’s sake? At eleven p.m. May pulled out several sheets of notepaper and a pencil. Sometimes writing poetry calmed her nerves. It helped her to focus upon who she really was; a rational, high school English teacher. May hunched over her desk, feet tucked under the rungs of the hardback chair. Much as she wished it wasn’t true, she felt vulnerable and alone right now. Nighttime always made her feel like a little girl again. Once, she had tried to tell Rick why, but he hadn’t understood. Tonight would be especially bad. Against her will, panic slid, like cold clammy fingers, into her soul. Maybe deep breathing would help. Slowly, she inhaled and exhaled, counting the seconds between each breath. The pencil point snapped. With a gasp, May stared at what she had written. Gibbering, inane rhymes about the bogeyman. Disgusted, she threw it aside with shaking fingers. The old nightmare clawed at the back of her mind, struggling to resurface. She wasn’t a child any longer. May focused on the page until the words ran together into a blurry soup. Rick would return from his conference on Monday. Only three nights alone to endure. She would be fine. In bed, she drew the crisp sheet to her nose and lay still, straining to hear every noise in the house. Marmalade, her orange and white cat, jumped onto the bed. He stepped on her, his paws poking deeply into her chest. After two turns he lay down, paws folded neatly under his white ruff. He sighed, and a throaty purr rumbled into the night. Nervous perspiration sprang onto her palms. “Marmy! You’re so loud.” Her heart thumped in a breathless gallop. May struggled to hear faint house sounds—such as the rattle of a door knob—above the dull roar. Impossible. She wished the rental house had an alarm. She rubbed the cat’s soft, whiskered cheek and tried to relax. Marmalade’s warm, furry body comforted her. Just like Banjo Teddy had when she’d been a child. She needed to rest. Foolishly, she wanted to take the ostrich approach, and bury her head under the blankets. What she couldn’t see or hear wasn’t there. Smiling at the silly idea, May’s fingers slowly stilled and slipped to her side, and she fell… down… down… down… The black tentacles of sleep curled over her mind. Mother screamed…and screamed and screamed..
May jerked bolt upright. Her chest heaved in sharp gasps. Perspiration drenched her cotton pajamas, and she shuddered uncontrollably. A ghastly shriek echoed somewhere…on the edge of her consciousness, but her mind’s eye still focused upon the dark images flickering through her brain; shadows in a macabre dance. Her gaze swiveled to the glass French doors. 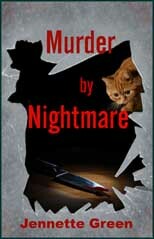 Marmalade’s massive, furry head had pushed aside the blinds and he glared into the backyard. At what? A guttural moan rent the night. May clawed aside the blinds. The waning moon washed the grass and shrubs a dusky silver color, but the far corners of the yard lay in darkness. The groan came again, weaker this time. Who was it? Was he in her yard? It was too dark to tell for sure, but she didn’t think so. May yanked on shorts and a T-shirt and grabbed her huge flashlight from the closet. Her legs felt like rubber as she moved toward the door, and her mind felt fuzzy. But she was certain of one thing. She had to help. Somehow. Before she could lose her nerve, May slipped into the backyard. A high, dreadful moan sounded from her left. Tom’s house! Fear vanished in a heartbeat, and May dashed for the fence. She scrambled onto a lawn chair and flashed the light down into Tom’s yard. “Tom!” Horror choked off the word. Her silver-haired neighbor lay crumpled on the patio. A river of crimson flowed from his pajama clad chest and pooled onto the cement. Tom’s eyes flickered open at her cry. “May… Help me,” he whispered. May had no idea how she vaulted the fence and landed in his yard. Within moments, she’d ripped off a piece of Tom’s shirt and pressed the ball of cloth into the oozing wound. “Hold this,” May ordered, and when his limp hand dropped onto the soaked ball of cloth, she sprinted into his house. The tract home possessed the exact same layout as hers, only flipped, so her feet took her unerringly past the elegant dining table and china cabinet, into the kitchen and to the phone. She barked information to the 911 operator, and then sped outside again to find Tom propped up on one elbow, his angular face drained as white as a ghost. “You shouldn’t be up!” She pressed a fresh dishtowel on top of the cloth bandage. “Lie down, anyway.” She was surprised when he obeyed. May pressed on the wound, and noticed that Tom had begun to shiver. Shock. The scream of sirens moments later relieved her. May stood back as the paramedics treated Tom and transferred him to a stretcher. She tucked her arms tightly against her body. Fear built up again, like the rumble of an oncoming motorcycle. Who had attacked Tom? Was it the killer who had murdered that teenage boy three blocks away? This insane idea stuck to her mind like glue. But why Tom? Why her neighborhood? May shivered, even though she knew she was being completely ridiculous. Frightened gooseflesh prickled up on her arms. The police questioned May, but she had seen nothing. Three officers fanned out to search for the weapon, but from their muttered comments a little later, May guessed they hadn’t found it. When May finally stumbled back to bed, after scrubbing her hands clean of blood, she found Marmalade snoozing on her pillow. “Move, Marm.” The furry lump didn’t raise an eyelid. Lacking the energy to move him, she collapsed onto Rick’s pillow. She envied the cat’s peaceful slumber. Attempted murder, right next door. May curled up into a tight ball. The attack, the sirens, the police, all seemed like threads from a dream. Or her own horrible nightmare. An omen? She hoped not. From experience, she knew nightmares never got better. Only worse.